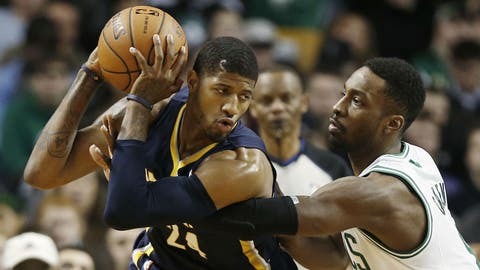 Paul George led the Pacers on Saturday night with 25 points against the Celtics. "I love instant replay!" Indiana coach Frank Vogel said with a smile. "Just a big fan, always have been, except for the couple of times it went against us." "That doesn’t change how we’re going to play," he said. "We’re just going to try to win the next possession and build from there." "It let the pressure off them," Boston’s Jared Sullinger said. "They were playing frantic when the score was (93-90). Then they took away that 3. We kind of let it slip away." "I missed too many easy shots (early) and I told myself when it comes back around that I have to make my shots," George said. "So I just locked in my focus and my teammates found me." "We kind of got it going in the third (quarter)," Humphries said. "(It) kind of took our wind out of the sails when that 3 didn’t count. (I) kind of wish they’d review it right away." "Evan Turner gave us a big lift throughout the whole game," Vogel said, "but, in particular, down the stretch."